How Bees Came to Make Chili is a cute story about how a bee became inspired to do something special with his life. It was written by Terry S Bradley. Mr. Bradley owns Nubbiebees, a honey store that is located in North Alabama and his honey is marketing to local stores across the south. How Bees Came To Make Chili is a children’s book that you don’t want to miss. It is just so cute that kids, parents and grandparents love it. Nubbiebee is a bee who has a short wing that was showing off one day and clipped his wing. He became downhearted when he could no longer fly. 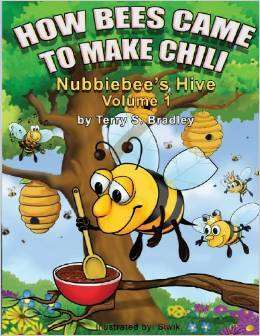 This story tells how Nubbiebee came to make chili and become happy again. Lots of life lessons to educate your young reader. It shows children that when life throws them a curve, they can still succeed! Life is ever-changing and the lessons learned can change the way we all see each other. Inspirational message about what we can do with the hope and belief of a better tomorrow. It instills a motto of “Dream Big”. This young elementary age reader is very interesting and inspiring. It is a fantasy tale of how a bee is injured and loses hope until he discovers something that he can do that makes his life worth while. It has a inspiring moral to the story. It has cute illustrations with a great storyline. Has 20 Pages. I would recommend this book to kids ages 3 to 12, but sure that other age groups will enjoy as well.